Cyprus – Beautiful WordPress Theme is unique in the way it looks and functions. Its clean and optimized design will improve your rankings, get you more traffic and generate more leads. Build Beautiful Posts & Pages With a Live Preview To Make Your Posts Look Better Than Your Competitors! Blow Your Competition Out of the Water With This SEO-Friendly and Conversion-Minded Theme. Cyprus has a beautiful layout that inspires visitors to keep coming back for more. It presents the content in a user-friendly layout. 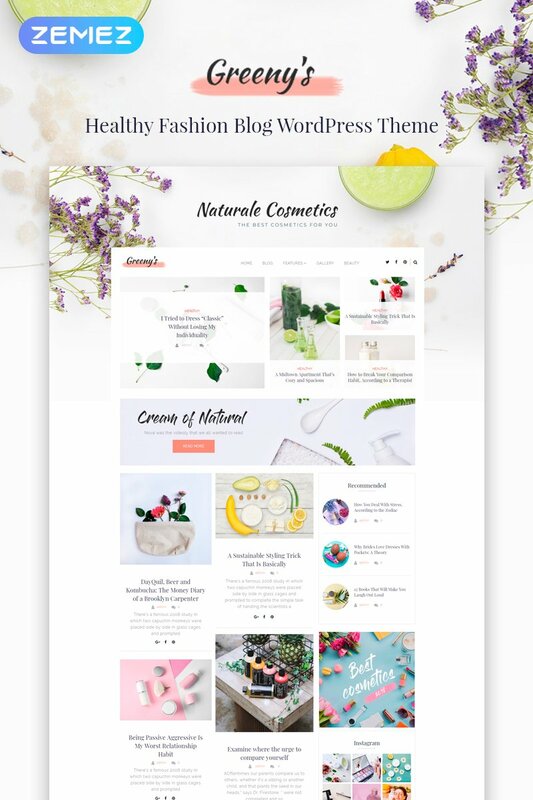 Greeny’s – Healthy Fashion WordPress Theme is a elegant and sophisticated Healthy Fashion WordPress Theme. Enriched with many plugins and options, it is the perfect choice to tell more about healthy cosmetics and fashion. With Greeny’s you will be able to manage and customize your content with powerful drag and drop Elementor page builder. It allows setting up information without any coding skills absolutely effortlessly and see the changes in live mode. The theme comes with a bundle of Elementor addons, specially developed to significantly enhance page editor’s functionality and add numerous elements at user’s disposal. Techguide-Tech Blog WordPress Theme is a great variant to engage more visitors on the site. Using a professional WordPress theme applied with high-quality functionality module and various plugins to fulfill your blog with the latest tech news, trends, launches, reviews and guides. With JetElements plugin you will be able to create an informative content and style it with many customization settings. JetTabs and JetBlocks plugins will help to add headers and footers and enrich them with content, also it will be available to organize content into stylish tabs and accordion blocks using Elementor Page builder. Journeo-Travel Agency WordPress Theme is an outstanding WordPress theme for presenting tourism services. With the theme you will create a profitable site for travel, guide agency, adventure tours, travel blog and tour operator. Demonstrate all the services of your travel agency with Journeo! You will enjoy the process of creating pages on your site using Jet plugins, which are included in the theme. With JetMenu plugin you will style your menu module using varied presets, also you will be able to add drop subsections. Bettaso – Cafe & Restaurant WordPress Theme is a responsive theme specially designed for restaurants, fast food and blogs about restaurants and fast food. It has a clean and minimalistic design that improves speed and ensures visitors focus on your content. 4News – News & Magazine WordPress Theme is a fully loaded theme, specially developed to display various news from all over the world! With 4News you will be able to manage and customize your content with powerful drag and drop Elementor page builder. It allows setting up information without any coding skills. The theme contains groundbreaking set of Jet family plugins, such as JetBlogs, JetReviews, JetTircks, JetElements, JetMenu and much more! 4News is equipped with outstanding JetThemeCore plugin allowing to create your own headers, footers, sections and even pages at ease! Targetty – Fancy Advertising Agency WordPress Theme is a fresh and crispy website that make visitors feel themselves in the middle of a park – that is exactly what a modern advertising agency needs. It will do half of the job for your company – Targetty WordPress template will attract the audience, impress visitors and ensure that they’ve come to the right place. The design is 100% responsive, so the design will look great no matter what device a client will use to enter your website – smartphone, tablet or a PC. 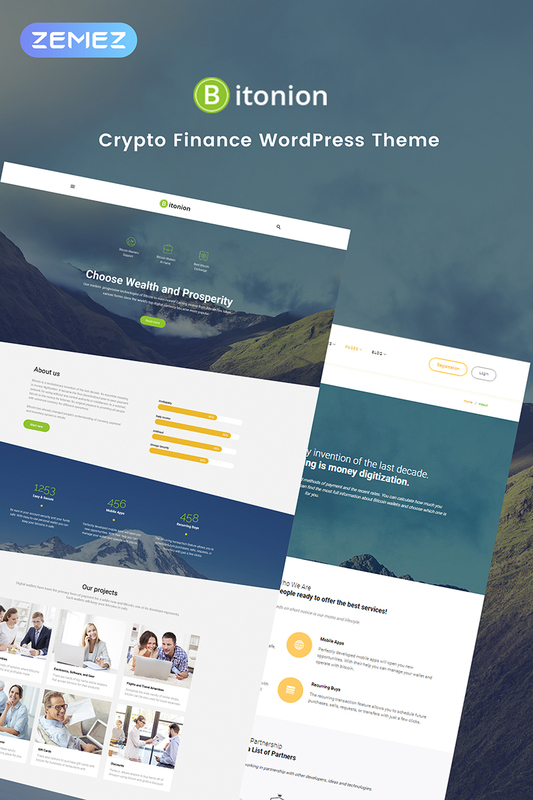 Bitonion – Cryptocurrency Elementor WordPress Theme is a premium theme for your cryptocurrency website. This theme has a stylish design, includes ready-made layouts. It is completely responsive – tested for correct operation with various mobile devices. Besides, it has a large variety of plugins, called to enhance your site’s functionality. You can edit and customize the theme in real time and create new page layouts using Elementor page builder. With Elementor and its addon – JetElements, it’s more than easy to craft and style each page according to your needs and preferences.